Cuba with its capital Havana is located in North America (Caribbean, island between the Caribbean Sea and the North Atlantic Ocean). It covers some 110,861 square kilometers (slightly smaller than Pennsylvania) with 11,147,400 citizens. Spanish is the language commonly spoken used by the people in Cuba. Interesting info United States is the only bordering country. 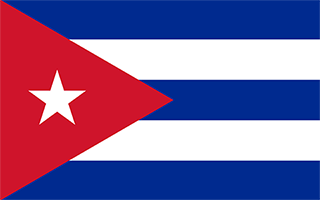 Cuba is the largest Caribbean island, between the Caribbean Sea and the North Atlantic Ocean. Walk along the Malécon during the early evening and take in some of Havana's culture. A popular saying goes that the best Cuban food can be found in the United States. Within Cuba, the best food will generally be found in your casa particular or in paladares (locally owned restaurants in private homes). Cuban national cocktails include the Cuba Libre (rum and cola) and the Mojito (rum, lime, sugar, mint leaves, club soda and ice). Cuba is generally a very safe country; strict and prominent policing, combined with neighborhood-watch-style programs keep the streets safe from violent crime. Cuba is considered very healthy except for the water; even many Cubans boil their water. That said, some travelers drink untreated water without ill effect. The best solution is bottled water and lots of it, especially for visitors who are not used to the 30+°C/85+°F temperatures. Cubans are generally friendly and helpful people. If you're staying at a hotel or casa particular, it's likely there will be a television, and watching Cuban television is a good place to observe Cuba's unique mix of vibrant culture, sports and controversial politics. To reach someone Cuba dial +53 prior to a number. The local cellular networks are operated on 900 MHz, 3G. Websites typically end with the top level domain ".cu". If you want to bring electric appliances (e.g. battery chaarger), keep in min the local 110 V / 220 V - 60 Hz (plugs: A, B, C, L). The sign for the locally used currency Peso is CUP. Five equal horizontal bands of blue (top, center, and bottom) alternating with white; a red equilateral triangle based on the hoist side bears a white, five-pointed star in the center; the blue bands refer to the three old divisions of the island: central, occidental, and oriental; the white bands describe the purity of the independence ideal; the triangle symbolizes liberty, equality, and fraternity, while the red color stands for the blood shed in the independence struggle; the white star, called La Estrella Solitaria (the Lone Star) lights the way to freedom and was taken from the flag of Texas. The native Amerindian population of Cuba began to decline after the European discovery of the island by Christopher COLUMBUS in 1492 and following its development as a Spanish colony during the next several centuries. Large numbers of African slaves were imported to work the coffee and sugar plantations, and Havana became the launching point for the annual treasure fleets bound for Spain from Mexico and Peru. Spanish rule eventually provoked an independence movement and occasional rebellions that were harshly suppressed. US intervention during the Spanish-American War in 1898 assisted the Cubans in overthrowing Spanish rule. The Treaty of Paris established Cuban independence from Spain in 1898 and, following three-and-a-half years of subsequent US military rule, Cuba became an independent republic in 1902 after which the island experienced a string of governments mostly dominated by the military and corrupt politicians. Fidel CASTRO led a rebel army to victory in 1959; his authoritarian rule held the subsequent regime together for nearly five decades. He stepped down as president in February 2008 in favor of his younger brother Raul CASTRO. Cuba's communist revolution, with Soviet support, was exported throughout Latin America and Africa during the 1960s, 1970s, and 1980s. On 8-9 September 2017, Hurricane Irma passed along the north coast of Cuba causing extensive damage to structures, roads, and power supplies. The country faced a severe economic downturn in 1990 following the withdrawal of former Soviet subsidies worth $4-6 billion annually. Cuba at times portrays the US embargo, in place since 1961, as the source of its difficulties. Over the past decade, there has been growing communication with the Cuban Government to address national interests. As a result of efforts begun in December 2014 to re-establish diplomatic relations with the Cuban Government, which were severed in January 1961, the US and Cuba reopened embassies in their respective countries on 20 July 2015. However, the embargo remains in place. Illicit migration of Cuban nationals to the US via maritime and overland routes has been a longstanding challenge. In FY 2016, the US Coast Guard interdicted 5,228 Cuban nationals at sea. Also in FY 2016, 44,553 Cuban migrants presented themselves at various land border ports of entry throughout the US. On 12 January 2017, the US and Cuba signed a Joint Statement ending the so-called “wet-foot, dry-foot” policy – by which Cuban nationals who reached US soil were permitted to stay – facilitating the repatriation of Cuban migrants. Illicit Cuban migration has since dropped significantly.